People in climates where this tree can’t be grown outside (most notably in the US) grow what they think are Norfolk Island Pines in pots in their homes. Unfortunately, they’re usually mistaken. What is mostly available as a houseplant is actually the Cook Pine (Araucaria columnaris). But for the folks living in temperate, tropical areas, true Norfolk Island Pines grace suitable growing areas and are certainly sights to behold. Not technically a pine tree scientifically speaking, this tree’s overall appearance and form still lend it to look very pine-esque, especially when young. This species is labeled as “vulnerable” and is a threatened species in its native island of Norfolk Island due to heavy harvesting in the past few hundred years. Protective measures have been taken to protect what’s left of this tree in its endemic homeland. Norfolk Island pines have a monopodial growth form, like most conifers. That is, they have a single trunk from which branches grow. The growth form is caused by strong apical dominance, growth occurring mainly towards the tip of the trunk. As mentioned above, when this tree is young, it looks very much like a pine tree. Perfect triangle silhouette with evenly spaced branches, this tree looks great even when most other coastal trees that it shares its native home with are twisted and mangled by prevalent winds. They grow tall at maturity, around 65 metres when mature. Single thin trunks are vertical and tall, which made them valuable as masts for ships during early colonization of the island. Unfortunately, it was found they had a tendency to break, which lowered their value somewhat. Young trees have different shaped leaves from older trees. When young, the leaves are awl-shaped, about a centimeter long and overlap each other in whorls on stems. Older trees have incurved 5-10mm long needle like leaves. Thicker leaves that look like scales form in the upper crown of the tree. 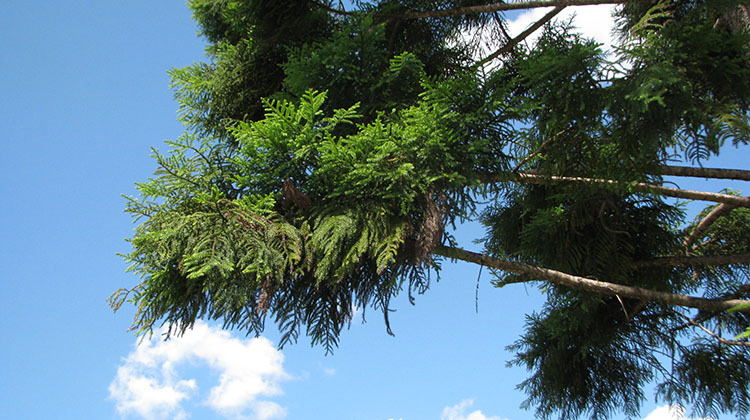 Although Norfolk Island pine trees are not actually pine trees, they are still conifers. They bear woody cones similar to most pine trees in that they open out to spread their seeds while still on the tree. Another misnomer, and one they also share with pine trees, is their cones being called male and female flowers. Conifers do not bear flowers. They branch off, on the phylogenic tree, specifically because they do not bear flowers (gymnosperms rather then angiosperms). There cones do, however, have male and female gender. Being on different trees, they are dieocious, though there are occasional trees which are not. Female flowers give way to squat globe-shaped cones that are about 12cm long and 14cm wide. They take 18 months to mature, and then they disintegrate and release edible seeds that look like nuts. Many of these trees are started from clippings for pot culture, but this method also works for landscape plants. Take 2-3 inch new growth stem cuttings and root them in rooting medium. Keep them warm and moist until they form roots. They can also be started from seed. 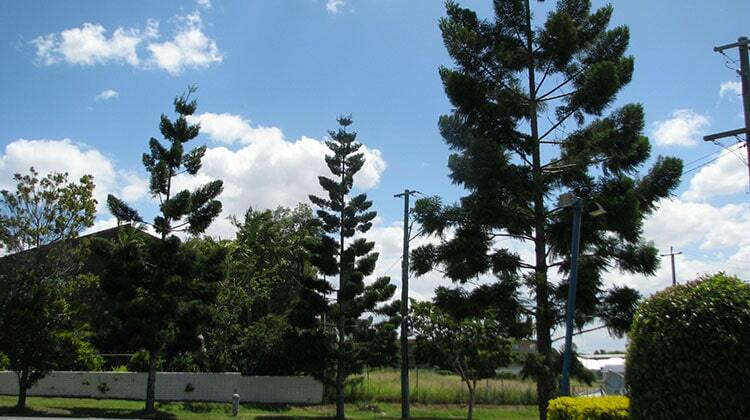 While highly adaptable to different climates, this tree does especially well in areas where many other trees do not. Adapted to marine winds, this tree relies on the salty spray from ocean winds. It requires nutritionally lacking deep sand for soil. They require constant moisture without standing water. They don’t do well in very high winds, but do fine in consistent ocean breezes and some moderate winds. In Brisbane, Norfolk Island pines are fine without added amendments to soil, but young trees do benefit from some added fertilizer to help new growth after a few weeks of being planted. Protect new seedlings for a year or two after transplant from high winds and sun that’s too direct. After establishing, this tree needs relatively no care. I actually agree with you completely. If I had it my way I’d probably have them all removes – all but a few of the oldest specimens – and use the reclaimed space to properly revegitate the area! Hi David, thanks for the article. Araucarias are fascinating trees. I do have a question though, one that comes from the fact that A. heterophylla gets frequently confused with A. columnaris (Cook “pine”) in my neck of the woods: is there a way to tell the seeds of these two species apart? Or is there a way to tell the seedlings apart when they sprout? I read somewhere that A. columnaris’ seedlings have narrower cotyledons, but 1. I don’t know if I can trust the source and 2. it didn’t provide any A. heterophylla seedling images for comparison. 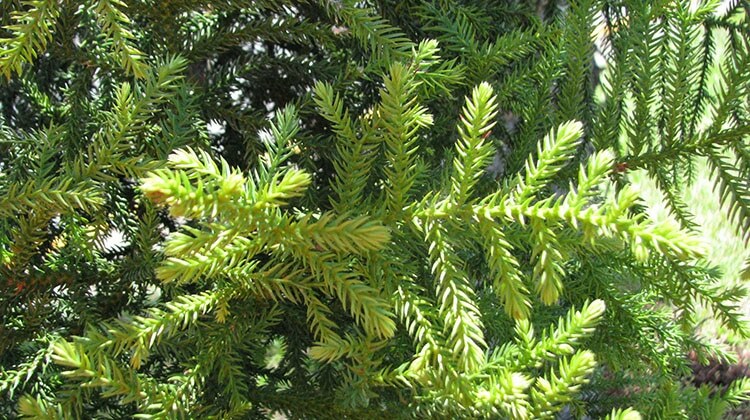 There are heaps of Cook pine images online (both seeds and seedlings) but comparatively few Norfolk Island pine images, and many of those are clearly Cook pines anyway. 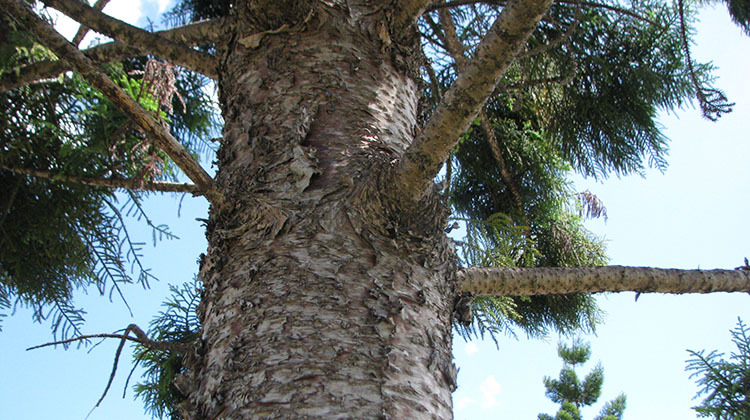 hi all, I have now found info on Norfolk pine roots – no deep tap root. After recent vey high winds and us moving out for the night just in case, I at last found it has a shallow root system, and the site said it is prone to being blown over. We now estimate the tree is 15 metres tall and still growing. It is in very sandy soil and is less than 2 metres from my house. If it falls it will kill anyone in its path., A couple of intense storms ago 2 branches fell – just the branches were huge and heavy. A level 5 arborist said I should not worry just have insurance – and if my time (to die) has come – it has come. He said the roots are shallow and in sandy soil have ‘sinkers roots’ spreading downwards from the shallow wide root system searching for nutrients. I asked re thinning out the branches at the top or lopping the top (its ugly but safety trumps aesthetics for me) to make it less prone to tipping over but he advised this could weaken the tree and cause it to fall. my question: can an arborist give me a second opinion of the risk of this falling and any negative impact of thinning out the branches? I have searched intensely for examples of falling Norfolk pines but found nothing – may be my flawed search criteria. .
I’ve been involved in the post-mortem of two Norfolk Island pines complete failures (that is, uprooting). Both trees were perhaps 100cm dbh and probably over 25m tall. One other large A. heterophylla had to be removed due to a fungal pathogen that had an entry point due to multiple branch failures. I’ve never seen a smaller tree of this species fail. Nevertheless, individual site factors play an important role so you were right in having your tree inspected. 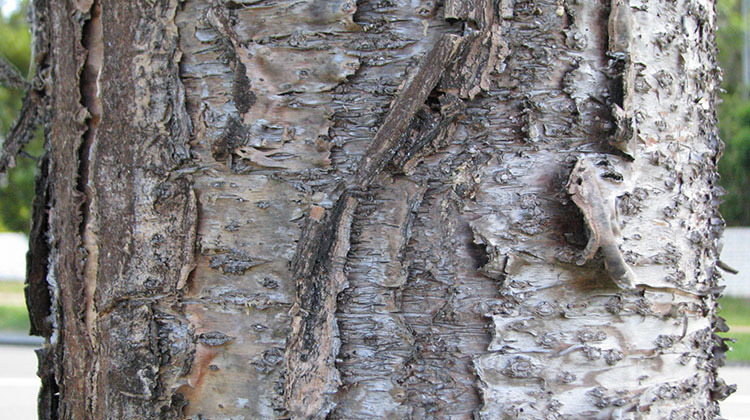 If you have branches removed by a qualified arborist you are unlikely to risk infection by pathogens, though tree loppers may prune the branches incorrectly and permit fungal entry at wound sites. But, why do you want it thinned out? Is it to reduce windage? Because that would largely be offset in a tree with this particular growth form by reduced strength as the branches absorb impact from the wind strengthening the trunk. I can give you a second opinion if you are in Brisbane but it’s unlikely my opinion would differ from your current information if you have used a competent level, 5 arborist, as we all rely on the same science. I thought trimming it would reduce the weight at the top of the tree and therefore cause less swaying and so less prone to falling. But your answer explains why the tree would be weakened if I trim it. – a risk for fungal entry thereby weakening the tree, and thinning out branches would mean the branches do not absorb the wind energy and instead the trunk would? So from the sound of it I am best off to cut the top outright with a certified arborist who would ensure it is cut properly and no fungal entry is possible? I hate the idea of making it ugly though. I know I can remove the tree as its so close to my house but I love its look shade, and home to large birds during nesting. Hi Martin. It depends where you are located. In Brisbane, it’s supposed to be from January to May (late summer to the end of autumn) and the seeds are already breaking out of the cones in Brisbane. I picked up a half-empty cone yesterday. Every fourth or fifth year there is very low cone production. It’s part of a natural cycle so quite normal. Regards, David. Perhaps I am very intusive, but is it possible to get 30 seeds from this tree? Hi Ton, Sorry, The Netherlands prohibits imports of seeds. Regards, David. I cannot find any information online on the root system of my norfolk pine tree. It is now extremely tall and the trunk is now 3.100 centimetres in circumferance. . I am confident if I try to build a hole for a pool a metre and a half from the trunk it will mean some of the root system will be destroyed. People tell me it has a deep tap root – but I cannot find confirmation of this anywhere. It is still growing. . Are you able to assist me with information re the roots please? Hi Liz. Do you mean its circumference is 3.1m? That would give you a diametre of just under 1 metre. The structural root zone (SRZ) of the tree is calculated using a fairly complex formula using the diameter of the tree just above the roots. Supposing it was 1m, your structural root zone would be 3.3m. No arborist should suggest it safe for you to excavate that close to the tree without compromising the structural integrity of the pine. If they have, please phone me immediately on 0488 827 267. Thanks, David. I have a very tall Norfolk Pine hard up against the House footing. Is continuued root growth going to be a problem. The tree is about 9 metres tall. Hi Jill. It’s not just the continued growth of your tree’s roots that will be a problem, the current roots under the footings will also be an issue. During dry weather roots contract leading to soil subsidence. How much of a problem it will be depends on your soil type: re-active clay being the worst. The tree is, unfortunately, in the wrong place. Also, if roots that close to the trunk were cut during excavation then your tree is not stable. Thanks for this great post – it’s very informative. We have a Norfolk Pine in our garden in the Manly Council area of Sydney. When we moved in ten years ago it was established and in that time it has become bigger (we can really see the difference when we look at old photos as you can see the change in the size of the trunk). We have designed this part of the yard around the tree and have no intention of removing it, it’s part of the family!! The needles are a pain but we deal with them…unfortunately I find they don’t do well in the compost!! One thing I struggle with is planting beneath it’s canopy. I’m unclear if anything will ever grow there because of the dropping needles and the soil condition. Could you please give me some advice re planting – will anything ever grow beneath it? Hi Liz. I suggest a generous layer of woodchip and planting Bromeliads. Nothing much else will grow successfully. David, Could you please explain why local councils have the burning desire to plant Norfolk Island Pines on the coastline. They are not native to Australia and do block water views of residents. Councils seem to be adamant that this is the only suitable tree for the coastal strip of Aus. Surely there are alternative plantings that grow to a lower height and would not block views. Would appreciate your comments. Hi Terry. Yes, there are alternatives such as Pandanus spp. and Casurinas. I often disagree with LGAs choice of species myself and I sympathise with your problem. Norfolk Island pines are a threatened species, vulnerable in their native environment. We grow them in Australia for aesthetic reasons and perhaps to make up for having harvested them in years gone by from Norfolk Island itself. I appreciate aesthetics are relative, especially considering your alternative view. Can you pls tell me how often norfolk island pines set their cones. I am interested because I wonder if it’s usually around every 7 years or so, or if it’s more to do with the coming weather conditions. Any thoughts? Hi Ros. I believe annually but some years have low production due to the cones being fertilized by trade winds and a natural cycle of low production every four-five years.